Flinging is a term used to describe a technique in which Portals can be utilized by the player in order to preserve (and increase) their momentum and reach otherwise-inaccessible areas. The concept of Flinging is first introduced in Portal Test Chamber 10, and is a fundamental technique in both Portal and Portal 2. Flinging makes use of the player's momentum and velocity, and the way in which they are preserved when traveling through linked portals. The technique behind the most basic type of flinging is to place one portal on a vertical surface facing a chasm or obstacle, and another portal on a horizontal surface that is on a level below the player's current position. The player must then jump (or drop) through the second portal, and will then be flung through the first portal while preserving their velocity and momentum. In this way, the player is able to cross gaps or avoid other barriers that that they would otherwise be incapable of overcoming. This technique is first introduced in Portal Test Chamber 10. Although the above technique is effective, it is not always practical, and this is especially true if the player is within a Test Chamber or area that features many metallic surfaces or is largely uniform. In order to overcome this, the player must use more advanced flinging techniques. Another common method of flinging requires that player place a portal one the floor, and the other on a high wall or panel. The player must then enter the first portal and drop towards the floor, recreating the first portal beneath them if needed. As the player falls, they should aim to re-enter the portal. As with the previous technique, the player will re-exit through the second portal while retaining the velocity and momentum acquired while dropping, effectively "double-flinging" themselves. An example of this technique is demonstrated in Portal Test Chamber 15, and is prominent in dozens of custom levels. A third method can be used when the player only has access to horizontal surfaces of different heights, and/or needs to build height rather than travel distance. Place the two portals on the different levels, and enter the lower one. As you exit, reposition yourself so that you can re-enter the lower of the two portals. As you repeat this process, you continue to "fall" infinitely and will go higher into the air each time you exit the portal; an example of this style of flinging is used in Portal: Prelude Test Chamber 09. Another technique involving horizontal surfaces exclusively requires the player to place one portal on the ground in an appropriate location, and then place a second portal on a horizontal surface on a level below the player's current position. As with the first technique, the player must then fall or drop into the second portal and emerge from the first. The key difference is that the portals must be alternated while the player is still in mid-air after passing through the second portal. Essentially, the player will emerge from the second portal that they have created and rise into the air before gravity forces the player to drop back through the portal. Before dropping through the portal however, the player must create a new portal on another surface and, after passing through it and rising into the air, must then recreate the first portal in another location. 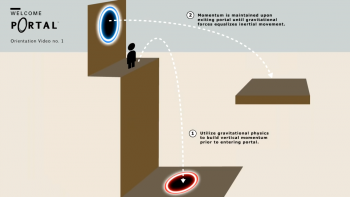 By repeating this process and alternating the creation of portals, the player can reach virtually any area as long as enough appropriately placed portal-conductive surfaces are present. This technique is used extensively in the final area of Portal Test Chamber 18. This page was last modified on 20 November 2016, at 00:54.